I can't think of a leafy green vegetable I don't like but I absolutely love Kale. Thankfully, Kale's star is on the rise among many of NYC's tastiest restaurants and I'm determined to eat my way through Serious Eats' 11 greatest kale dishes in the next few months. Kale is considered one of mother nature's "superfoods" and is jam-packed with lots of good stuff like iron, folate, calcium, potassium, magnesium, and vitamins A and C. This cruciferous vegetable has been proven to have anti-oxidant, anti-inflammatory, and anti-microbial properties. Kale is cardio-protective (i.e. it safeguards your heart) and also helps to reduce cholesterol. The magic components of Kale are several isothiocyanates which not only ward-off potentially life-threatening carcinogens but also serve to break-down and speed-up removal of those which may already be present. In terms of breast cancer specifically, Kale has been shown to reduce the estrogen metabolite, 16 alpha-hydroxyestrone, which researchers have identified as a cancer gateway. Similarly, Kale stimulates "apoptosis" (aka: cell suicide) and inhibits "angiogenesis" (the process by which cancer cells signal surrounding healthy tissue to grow new blood vessels in order to promote the tumor's own growth.) A Korean study even showed that some components of Kale heighten the anti-cancer fighting properties of Taxol, a drug used in chemotherapy. I'm kind of a lazy cook so I normally just sauté my kale with olive oil, sea salt, crushed red pepper, and garlic and top it off with a splash of red wine vinegar. Since I love potato chips though, I'm going to whip up a batch of these yummy Crispy Kale Chips with Lemon courtesy of the Food Network's Guy Fieri. 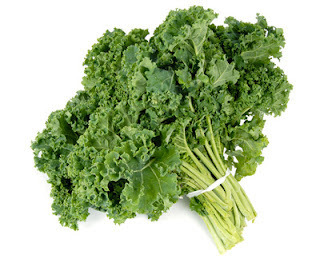 For more information on Kale visit The World's Healthiest Foods website.